The image below is of Monterossa as we left the dock. You can see in the lower part of the photo, just above the water, an old Nazi bunker. There is another one but it is not in this photo. 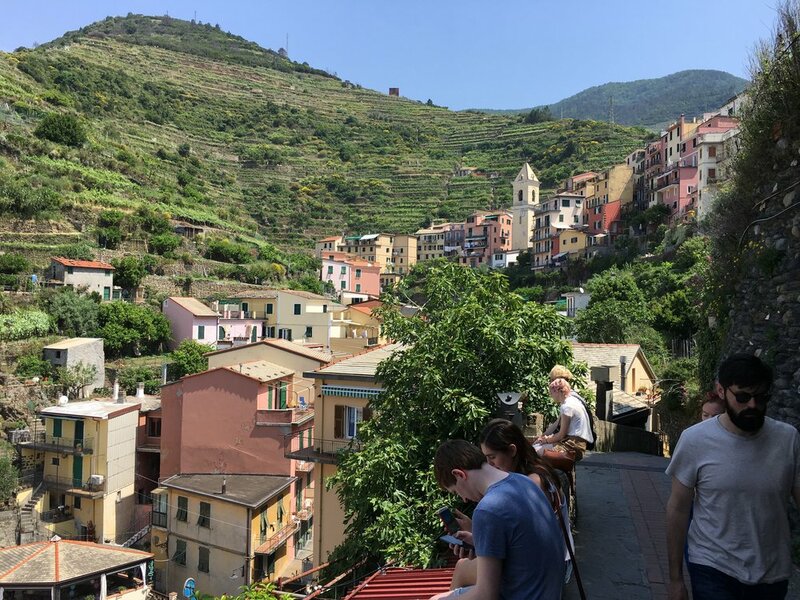 The towns of the Cinque Terre are nestled in valleys, on the hills around the valley all the way down to the Mediterranan Sea. On Janice's right (our left) in the photo are Patti, Eileen, and Eileen's husband Ken. We've spent a lot of time with this folks on our trip, they are really fun to be around! The photo below is of Riomaggiore, the first city we visited. This town was a tall town, stone stairs going everywhere, especially up! We spent about an hour here before catching the boat north to Manarola. 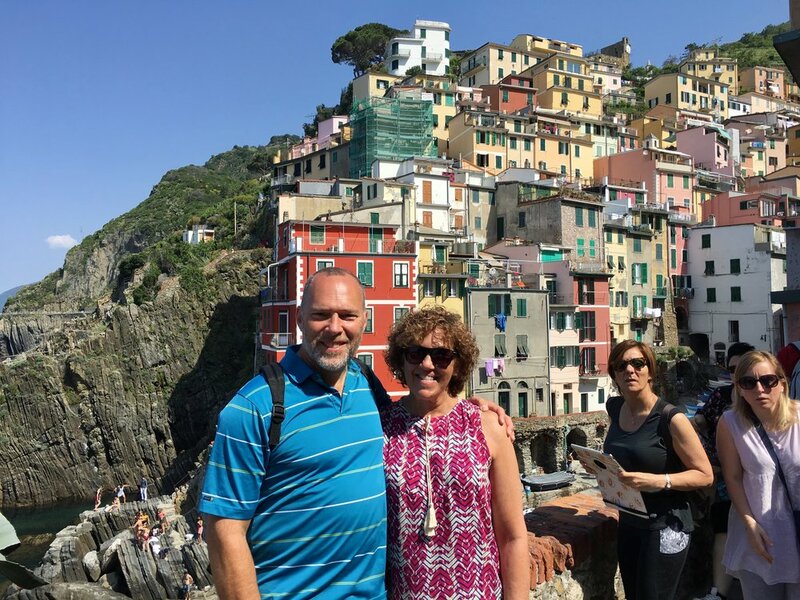 I don't remember who we got to take our photo here in Riomaggiore, but I guess they were wearing a Big Bird suit or something, just look at the expression on the ladies faces on the right side of the image below. Sorry, but I'm not sure if the photo below was taken in Manarola or Riomaggiore. But it sure is beautiful scenery. Boats anchored just off the port of this town, bobbing around in the Mediterranean. 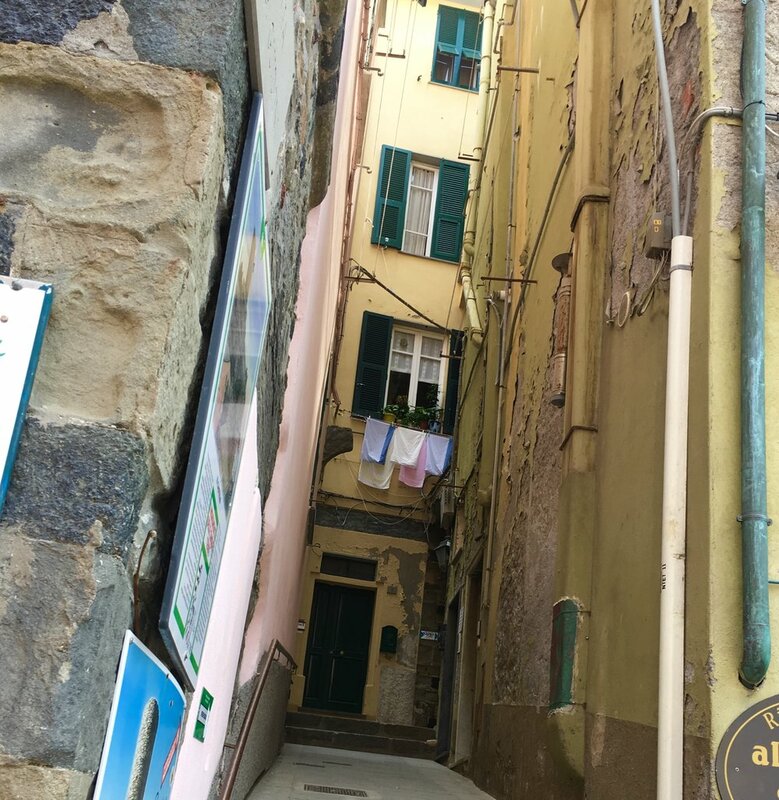 The image below is of Vernazza. This was Janice's favorite of the four we visited. Its a very pretty town, and much easier to walk around in than Manarola and Riomaggiore. The grade is not so steep. We spent a good while here, almost two hours. We walked up the hill through the center of the town, all the way to the car park on the upper end. Such a nice place. One of the things that Janice thought was so charming was seeing peoples wash drying out on clotheslines outside their windows. The view below is in Vernazza, not far from the harbor. Back in Monterossa, this is one view of the beach. This big old rock is just right there, and we saw people climbing up on it at one time earlier. Selfies are the thing here, lots of folks like taking them, including one of the women in our group. I don't remember her name, but I think her initials are JW . . . The water is so clear here, I don't know how deep it was, but you can see these huge rocks on the bottom. We could see equally clearly when we were on the boat as it was nearing the various docks. A very busy beach scene in Monterosso.